Ludovici mentions this work (or possibly the oil painting for which this may be a study) in his memoirs, An Artist’s Life in London and Paris, 1870-1925, London 1926, p.70: ‘In 1878 I was elected a member of the Society of British Artists. A picture I had just completed of Mr Coulon’s dancing class had been seen by several members of that Society, who informed me that if I would exhibit the picture they would make me a member. This picture and its companion, Signor Cruvelli’s singing class, were afterwards reproduced… by etching… The dancing class was well noticed in the papers, and was, I may say, a success.’ Ludovici’s father, Albert senior (1820-94), also produced a number of similar costume pictures, set in 18th century ballrooms and drawing-rooms. A related work by Ludovici junior is Jousting on the river of 1884, a highly-finished oil painting of a couple in 18th century dress. 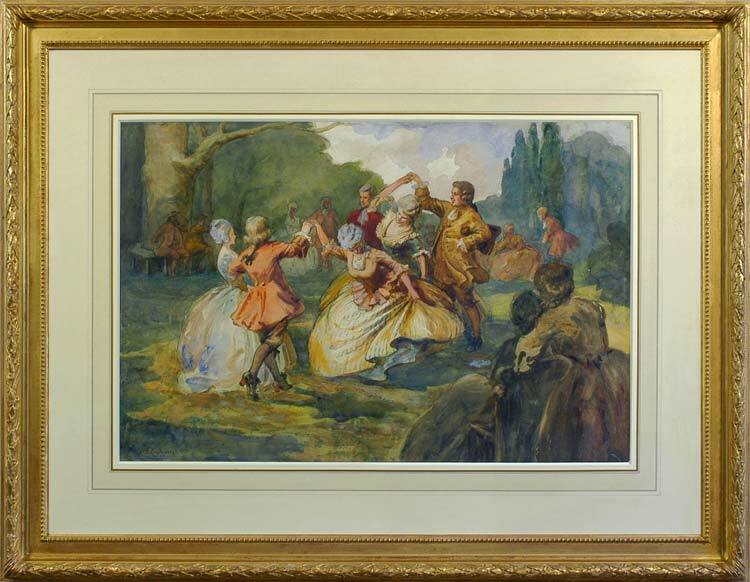 Monsieur Coulon’s dancing class is a more spontaneous study, its pastoral setting sketchily suggested, the focus being on the complex, Watteau-esque group of interwoven dancers. A contemporary note is struck by the foreground spectators, cut off by the borders in the manner of Degas and Caillebotte. Albert Ludovici (1852-1932) was born in Prague of Bolognese origins, although the family seems to have lived in England from his babyhood. He studied at the Académie Charles and the Ecole des Beaux Arts in Paris, where he was taught by Cabanel, Gérôme and Pils and his fellow pupils included Gervex, Forain and Bastien Lepage. He left Paris when the Prussians invaded, helping his father with the decorative painting of interiors which was his main source of income, but returned to Paris after the war to live by painting portraits. After his marriage in 1875 he settled in England and taught art – in a revolutionary step, to female pupils.